We all learn that heat rises. This past weekend in Medora guests experienced this phenomenon first hand. Hot air balloons from North Dakota and surrounding states came to Medora for the 12 annual hot air balloon rally. In the early morning hours the pilots, ground crew, passengers and spectators met outside the Badlands hotel to watch a small helium balloon float off into the twilight. The weather plays a critical role in piloting a hot air balloon. Pilots and passengers alike go wherever the wind takes them. 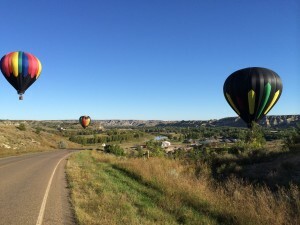 Traveling to Medora with a balloon doesn’t guarantee that the balloon will fly. After watching the small balloon and the forecast it was determined that the balloons would fly this year! As the sun came up, a flurry of activity began on the lawn east of the Badlands motel. Trucks with trailers and large vans scattered about to unload their cargo – eight colorful hot air balloons! I’d never realized how much work went into getting these picturesque aircraft up in the air. I was delighted when the wicker baskets were unloaded. I’d hoped one balloon would still use wicker for nostalgic reasons. In an age of modern plastics and synthetic materials, giant baskets seem incredibly old fashioned. Apparently nothing can match wicker’s flexibility and strength. 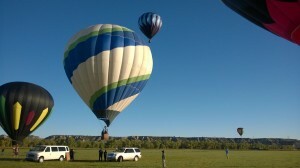 Balloons were stretched out on the lawn by a crew of pilots, crew, and passengers. Weighing in at over 300 pounds means just moving the fabric of the balloon takes a group of people. Frames and burners were attached to the wicker basket by a series of pins, and then the balloons were attached to the frames by cables. The whole process was fascinating. Large fans are used to inflate the balloons while lying horizontal on the ground. I was tasked with holding a rope attached to top of the balloon to keep the aircraft steady while a 3000 BTU burner heated up the air in the balloon. If heat is added too soon the balloon’s fabric can collapse on the burner/engine. The power of hot air had never been so apparent… I was drug across the lawn in what felt like a futile tug-of-war trying to keep the balloon steady and allow the last bits of the balloon to inflate. It was exhilarating! As the balloons stood tall, passengers climbed aboard the wicker baskets and rose above the town on an exciting adventure! 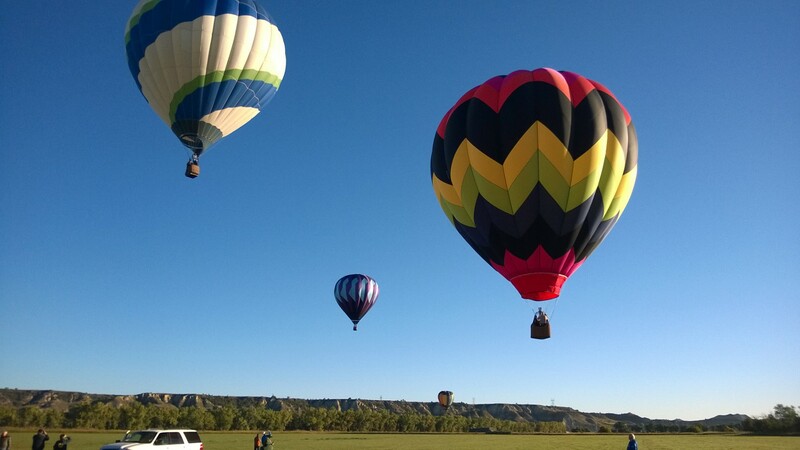 I loved watching the colorful balloons come to life in the early morning sun, having the opportunity to photograph these beauties in beautiful Medora was an added bonus! What goes up must come down and the crew was led on a merry chase through the park to recover the balloons. When we arrived at the landing site north of the park, the balloons were scattered about and deflated. It takes as many people to pack a balloon for transport as it does to get into the air! The process was quite the experience and the passengers were elated. Bucket list items were checked off a list and memories were made to last a lifetime. 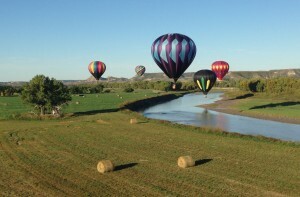 On Sunday the process was repeated, except a new set of passengers were treated to a flight from the Maltese Cross Ranch, over Bully Pulpit and along the Little Missouri river. The balloons landed just south of town and put on a great show for Medora visitors! While I didn’t get to fly, my introduction to the world of ballooning was fantastic, if a little cold. 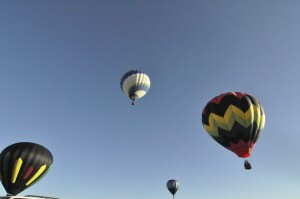 The people were wonderful and I’m excited to help out at next year’s balloon rally. This activity has been on my bucket list for years. Is it possible to become a passenger in one of the balloons? If so, how does one go about getting on board? I love balloons, something so breath taking about them! 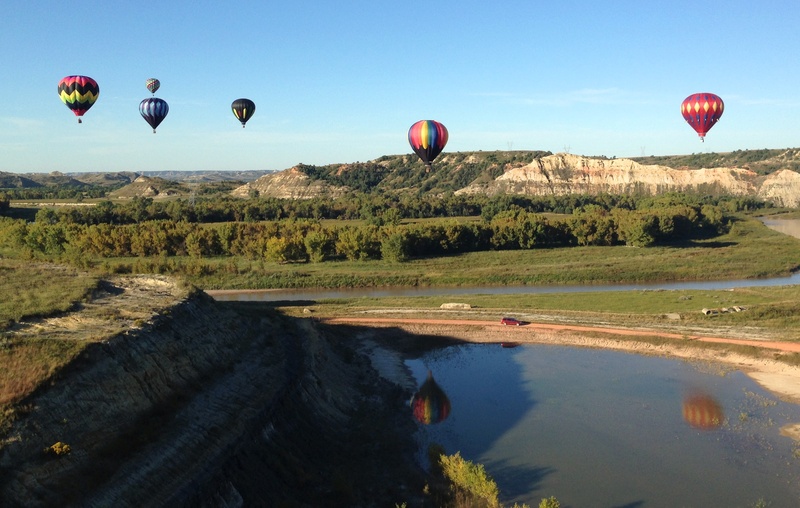 What better place to have a balloon ride than over Medora?! Would it be possible to go up in one? Would it be possible to go up in one? I’ve wanted to do this for years!